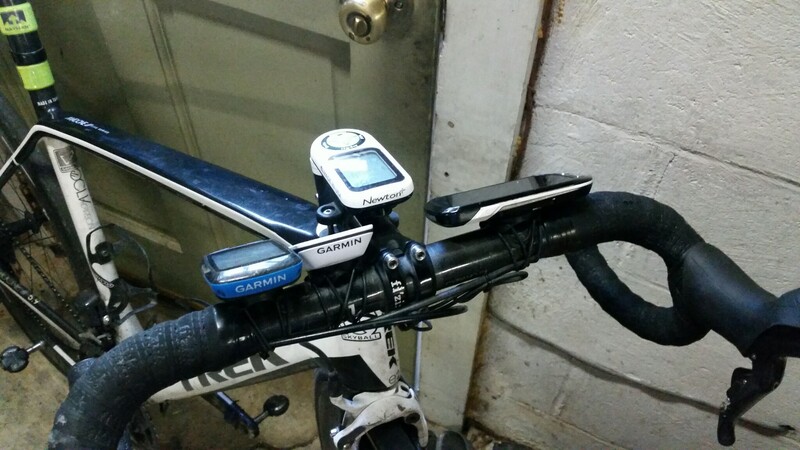 “Turtles all the way down” – Garmin Edge 520, Edge 800, Edge 1000. I only gave it one ride, but the new Garmin Edge 520 is running the latest Garmin firmware design, which includes an absolutely ridiculous elevation filter. That’s disappointing, because this small GPS unit has such great potential. I wanted it to be a reliable device for recording my long rides, while still running the Garmin 1000 for all of its mapping and routing capabilities and large screen. I am looking for a replacement for my Garmin 800, which has well over 75,000 miles on it since I got it to replace the Garmin 800 I lost on the first lap of the Barn Burner 104 mountain bike race in June 2012. 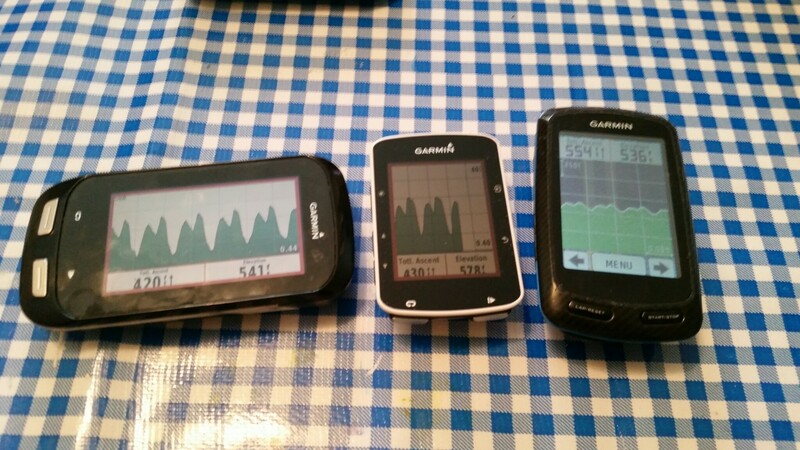 My Garmin 800 shown in the middle of the picture above still turns on and records rides, but the touchscreen doesn’t work, and it will no longer transfer data to a computer for upload. Back to the Garmin Edge 520, you have to be climbing for some length of time (30-45 seconds) before it starts counting any of the elevation gain towards your total ascent. It will then count most of the elevation that you just climbed, so that on big climbs there is no loss compared to other Garmin models. The problem is if your climb is only a small hill that takes less than 45 seconds to climb then you get zero credit for elevation gain. It doesn’t matter if you are cranking out 500+ watts to climb a 15% hill, if the hill takes less than 45 seconds to climb before descending again, you are out of luck – zero elevation. This is especially frustrating because the Garmin 520 shows and records the changes in elevation, but just doesn’t count it towards the total ascent figure. So I’m returning the 520 and have a new 800 on the way from eBay since it is a discontinued model that Garmin is no longer selling. 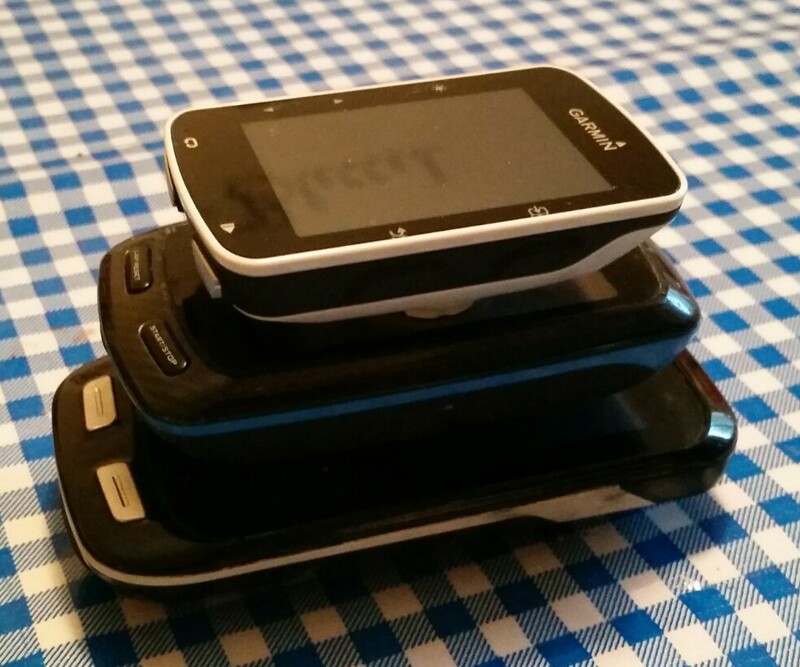 Three GPS devices and one iBike. Elevation bug on the Garmin Edge 520 that has been on the first version of every firmware for every edge device released by Garmin – if you are not following a route, the elevation profile screen will not expand to the whole screen. Garmin has fixed this in every Garmin, but they always seem to forget about the problem and re-release firmware for the new devices with this same problem. Bad software engineering. 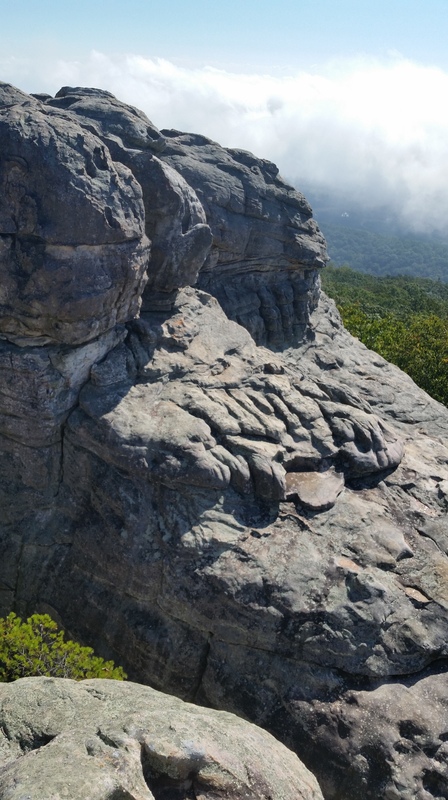 This entry was posted in Misc, Training and tagged garmin on October 18, 2015 by kartoone.